Think of the French Enlightenment, and who comes to mind? Probably Voltaire, Diderot, Montesquieu and their impressive achievements like Candide, the Encyclopedie, and The Spirit of Laws, works that spurred the intellectual and philosophical movement of eighteenth-century Europe. Though the Enlightenment is often considered a male-dominated endeavor, French women played important roles, too. Elite, educated women often held salons--forums hosted in private homes where spirited debate on topics from education to politics accompanied sumptuous meals. (This is France, after all.) Women held court in these salons, selecting topics, curating the guest list, and using the venue to seal their social status. One of the more famous Parisian salonnières was Catherine de Vivonne, marquise de Rambouillet, who ran a salon at the Hôtel de Rambouillet, the first of its kind and which likely inspired Molière’s scathing one-act satire les Précieuses ridicules. Today, Houghton Library at Harvard University is hosting a symposium on these and other ladies of the Enlightenment called, appropriately, “Rethinking Enlightenment: Forgotten Women Writers of Eighteenth-Century France.” Members of Harvard’s Department of Romance Languages and Literature as well as guest professors from the Universite de Lille and Wellesley College will discuss the works of women who participated in the Enlightenment “but were excluded from its history until recently.” The discussion accompanies an exhibition on view through April 28, Rethinking Enlightenment, curated by Harvard senior and forum participant Caleb Shelbourne, who assisted professor Christie McDonald with research for her forthcoming two-volume work, Femme, Littérature. Une histoire culturelle (Paris: Gallimard, 2019). The symposium comes two days after International Francophonie Day, an annual event celebrated by 220 million French speakers on five continents. Think of the French Enlightenment, and who comes to mind? Probably Voltaire, Diderot, Montesquieu and their impressive achievements like Candide, the Encyclopedie, and The Spirit of Laws, works that spurred the intellectual and philosophical movement of eighteenth-century Europe. Though the Enlightenment is often considered a male-dominated endeavor, French women played important roles, too. Elite, educated women often held salons--forums hosted in private homes where spirited debate on topics from education to politics accompanied sumptuous meals. (This is France, after all.) Women held court in these salons, selecting topics, curating the guest list, and using the venue to seal their social status. One of the more famous Parisian salonnières was Catherine de Vivonne, marquise de Rambouillet, who ran a salon at the Hôtel de Rambouillet, the first of its kind and which likely inspired Molière's scathing one-act satire les Précieuses ridicules. 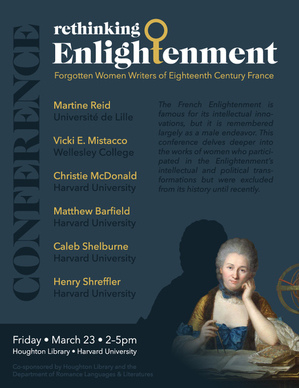 Today, Houghton Library at Harvard University is hosting a symposium on these and other ladies of the Enlightenment called, appropriately, "Rethinking Enlightenment: Forgotten Women Writers of Eighteenth-Century France." Members of Harvard's Department of Romance Languages and Literature as well as guest professors from the Universite de Lille and Wellesley College will discuss the works of women who participated in the Enlightenment "but were excluded from its history until recently." The discussion accompanies an exhibition on view through April 28, Rethinking Enlightenment, curated by Harvard senior and forum participant Caleb Shelbourne, who assisted professor Christie McDonald with research for her forthcoming two-volume work, Femme, Littérature. Une histoire culturelle (Paris: Gallimard, 2019). The symposium comes two days after International Francophonie Day, an annual event celebrated by 220 million French speakers on five continents.